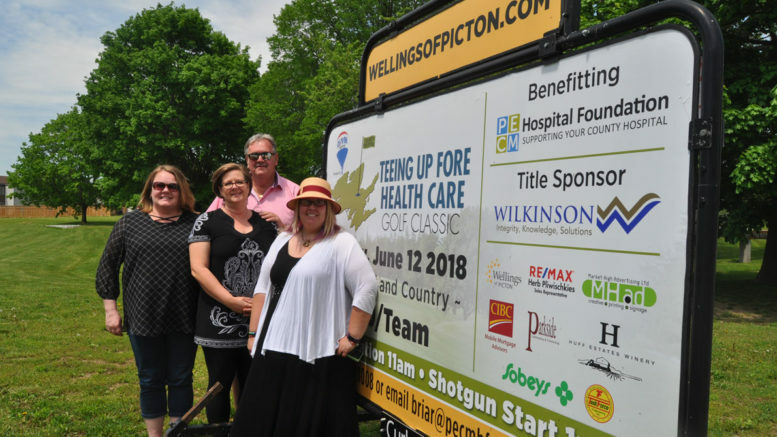 With less than three weeks to the fourth annual Teeing Up Fore Health Care Golf Classic, June 12, the organizing committee is looking for just three more groups to sell out the tournament again. The tournament has been a collaboration between Re/Max Quinte and the Prince Edward County Memorial Hospital Foundation. It started with the company’s agents realizing that health-care facilities are an important consideration for people buying homes. The tournament reflects the company’s commitment made in 2016 to bring its contributions to the hospital up over the $250,000 mark by raising an additional $145,000 through the tournament and by donating a percentage of commissions to the foundation. It is expected this year’s effort will lift the tournament’s cumulative past the $100,000 mark. Almost immediately, other sponsors came on board and many have stayed involved. Wilkinson and Company has been a $5,000 title sponsor all four years, now giving $20,000 to the hospital. Others like The Wellings of Picton, Parkside Landscaping and Contracting, the CIBC Mobile Mortgage Team, MarketHigh Advertising, and Pliwischkies himself are $2,500 sponsors. Some companies have also been diligent in providing in-kind support. Sobeys donates a barbecue lunch, Picton Home Hardware gives gift card prizes, and Huff Estates offers wine for golfer gift bags. “Our corporate sponsorship has been amazing, we’re fortunate to have a lot of repeat sponsors,” added Briar Boyce, the communications co-ordinator for the hospital foundation. This year, tournament proceeds will be dedicated for two Trilogy 202 portable ventilators for the emergency department. According to Boyce, the cost of the machines is $31,902. The provincial government does not fund medical equipment, so the foundation is responsible for raising money for the ventilators and any other requirements at the hospital, which treats more than 39,000 patients annually. The cost to play is $600 per group — $150 per player — which includes 18 holes with cart, lunch, and a prime rib dinner catered by The View Restaurant. While the tournament itself may soon be at capacity, there are several ways the public can still contribute. Prize donation and sponsorship are still welcomed, as are volunteers on June 12. To register for the remaining golf spaces, or to help in other ways, please call Boyce at 613-476-1008 ext. 4425. The public is also welcome to visit the Picton Golf and Country Club June 12 to participate in the silent auction. Among the items for bid are a stay-and-play package from the Brookstreet Hotel in Kanata, a puck signed by an Ottawa Senator, and an item from the Toronto Maple Leafs. Last year, the Maple Leafs sent a team autographed stick that went for $1,100 in a live auction.